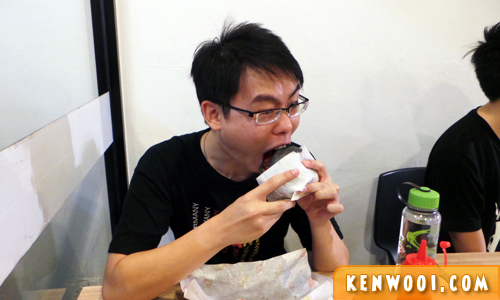 myBurgerLab, a burger outlet at Seapark, has been making a-bun-dant waves all over the Internet. I like burgers, and when there are good burgers out there, I would give it a try. So, when I first heard about myBurgerLab, I naturally wanted to give the well-known burgers a try. 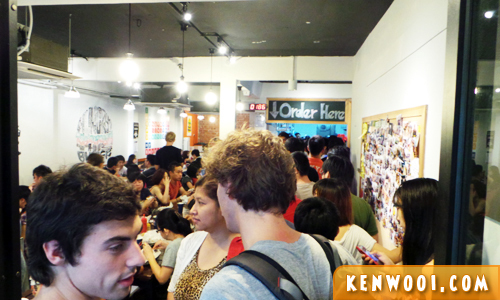 As you can see, the queue is from the counter till the entrance of the outlet. Except at Sushi Zanmai, it’s quite rare to see people queuing for food. So what does myBurgerLab offer that enables them to attract such consumer behaviour? Is it because of the charcoal bun, or is it because of the unique menu? To be frank, the price is pretty much on the high-end. 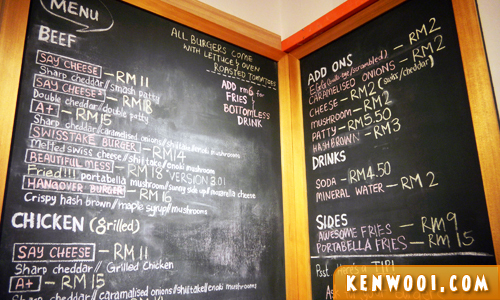 Each burger (a la carte) costs more than RM10, and the exquisite ones are close to RM20. After placing my order, the wait commenced. 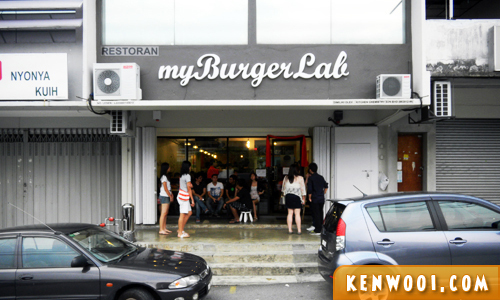 Just look at how crowded myBurgerLab is. The queue doesn’t stop! Anyway, we didn’t wait for long since they have sufficient kitchen staffs preparing the burgers. The supply-demand management is excellent. 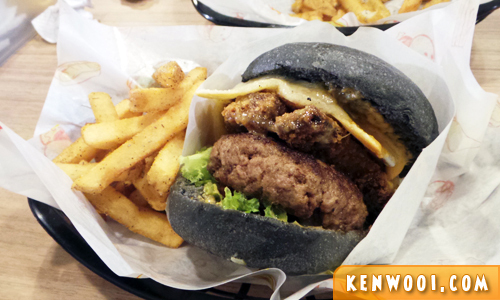 The concept of serving burgers with charcoal buns is a distinctive concept – it should be healthier, right? Perhaps that’s the reason why it’s slightly expensive as well. 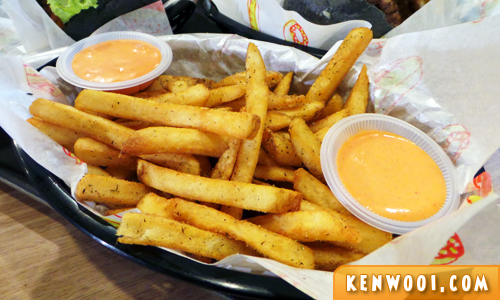 Here’s the plate of “Awesome Fries” – that’s what they wrote on the menu board. It’s actually Cajun Fries – pretty good! It’s called the “Beautiful Mess” – beef, portabella mushroom, mozzarella cheese, sunny side up and anything else that I’m clueless of in between the buns. I look like a dinosaur when I try to take a large bite out of the burger! Rawr!!! Anyway, it was a good experience dining there. 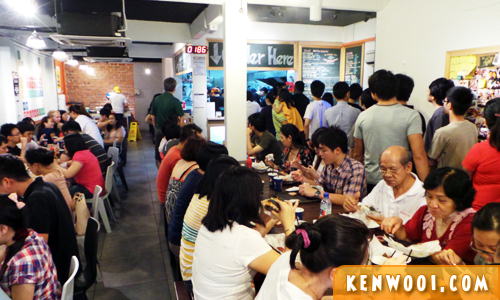 The burgers are worth trying out, and the service is commendable, especially when dealing with a large crowd of customer. Now, I think I deserve a free burger from myBurgerLab. Can? Kthxbai! the burgers are magnificent but everyone has problem with the queue, so do i.
I want one! Haven’t tried this yet. LOL….so nice ah…….so large bite. a free burger from myBurgerLab…. I Want Too.. The queue is really amazing! But thankfully service was good. Burgers looked good too! awesome burgers but hate the queue.